The genus Phytophthora includes a group of agriculturally important pathogens and they are commonly regarded as water molds. They produce motile zoospores that can move via water currents and on their own locomotion in aquatic environments. However, zoosporic response to dissolved oxygen, an important water quality parameter, is not known. Like other water quality parameters, dissolved oxygen concentration in irrigation reservoirs fluctuates dramatically over time. The aim of this study was to determine whether and how zoospore survival may be affected by elevated and low concentrations of dissolved oxygen in water to better understand the aquatic biology of these pathogens in irrigation reservoirs. Zoospores of P. megasperma, P. nicotianae, P. pini and P. tropicalis were assessed for survival in 10% Hoagland’s solution at a range of dissolved concentrations from 0.9 to 20.1 mg L-1 for up to seven exposure times from 0 to 72 h. Zoospore survival was measured by resultant colony counts per ml. Zoospores of these species survived the best in control Hoagland’s solution at dissolved oxygen concentrations of 5.3 to 5.6 mg L-1. Zoospore survival rates decreased with increasing and decreasing concentration of dissolved oxygen, depending upon Phytophthora species and exposure time. Overall, P. megasperma and P. pini are less sensitive than P. nicotianae and P. tropicalis to hyperoxia and hypoxia conditions. Zoospores in the control solution declined over time and this natural decline process was enhanced under hyperoxia and hypoxia conditions. These findings suggest that dramatic fluctuations of dissolved oxygen in irrigation reservoirs contribute to the population decline of Phytophthora species along the water path in the same reservoirs. These findings advanced our understanding of the aquatic ecology of these pathogens in irrigation reservoirs. They also provided a basis for pathogen risk mitigation by prolonging the turnover time of runoff water in recycling irrigation systems via better system designs. Phytophthora species, a group of fungal-like destructive plant pathogens, are known as water molds [1–4]. They produce motile zoospores that can spread through irrigation systems from runoff water retention basins at ornamental crop production facilities and cause severe plant diseases and crop losses. Over 40 species of Phytophthora have been recovered from irrigation systems and natural waterways . Zoospores generally are short-live and their survival is subject to environmental stresses. Majority of zoospores survive for less than 24 h [6–8]. Zoospore survival of individual species in aquatic environments depends upon water pH [7, 9], electrical conductivity (EC) , and CO2[10, 11]. Dissolved oxygen is another important water quality parameter. Dissolved oxygen concentration in agricultural reservoirs varies among water sources and fluctuates seasonally as well as diurnally within the same sources due to activities of phytoplankton, change of temperature and atmosphere pressure . Dissolved oxygen concentration in lakes, streams, and ponds that receive runoff from nurseries was 9.0, 7.0 and 12.0 mg L-1, respectively . Dissolved oxygen concentrations in runoff water containment basin that was also an irrigation reservoir varied from 0.3 to 26.5 mg L-1 over time . These oxygen concentrations are much lower than the atmospheric oxygen level of 21% or 276 mg L-1 based on the air density of 1.2 g m-3 with 23.2% of oxygen at the sea level (http://www.en.wikipedia.org/wiki/Atmosphere_of_Earth). Dissolved oxygen is known to affect the survival of fish and other aquatic organisms including algae . Whether and how dissolved oxygen may affect zoospore survival of Phytophthora species in irrigation reservoirs is not known. Previous studies in relation to oxygen have focused primarily on other propagules in terrestrial rather than zoospores in aquatic environments. Species of Phytophthora grew well in oxygen concentrations from 0.04% to 21% (or 0.5–276 mg L-1) in soil or on agar media [15, 16]. Mycelia can grow under a wide range of oxygen conditions as long as its concentration was below 1.6% (or 21 mg L-1) [15, 17]. However, Phytophthora species produce sporangia in water films under a narrow range of dissolved oxygen concentrations. For instance, sporangium production was prolific at an oxygen level of 5% (or ≥ 65 mg L-1) but production nil to few at 1% (or 13 mg L-1) . Few oospores were produced at atmospheric oxygen levels of 276 mg L-1 or higher while numerous were produced at much lower levels at 13 and 65 mg L-1[16, 17, 19]. Disease development delayed in plants inoculated with P. cinnamomi at an oxygen range of 0.9–2.3 mg L-1 in aeroponic and hydroponic systems [20, 21]. These studies demonstrate that different propagules may require different levels of oxygen for production, growth and survival. Here, we report the effects of elevated and low concentrations of dissolved oxygen in a simulated aquatic system on zoospore survival for several Phytophthora species. The aim of this study was to develop a better understanding of aquatic ecology of Phytophthora species, establishing a base for devising sustainable mitigation strategies for these pathogens in irrigation water. The base medium used for all the experiments in this study was 10% Hoagland’s solution. The full strength solution was prepared with Hoagland’s basal salt mixture (MP Bio, Solon, OH, USA) and adjusted with NaOH to have a final pH of 7.0. To maintain a stable pH, the stock solution was buffered with 1 mM MES hydrate (Sigma, St. Louis, MO USA) and stored at 4°C until use. The stock solution was freshly diluted with dH2O at 1:10. The diluted solution was then placed in 500-ml glass bottles leaving no or little room for air. Bottle filling was done 18–20 h ahead of experiment to allow temperature equilibrium. As measured with EcoSense® DO 200 meter (YSI Inc, South Burlington, VT, USA), dissolved oxygen concentration in the control solution (CK) as static 10% Hoagland’s solution at 23°C was 5.3 to 5.6 mg L -1. Although nitrogen does not react with water it dissolves in water at 20 mg L-1at 20C (http://www.lenntech.com/periodic/water/nitrogen/nitrogen-and-water.htm). To determine whether dissolved N2 in the solution from bubbling pure N2 directly affects zoospore survival, assays were performed with four selected Phytophthora species. Three treatments were included: (i) CK–the control Hoagland’s solution, (ii) N2–the same solution bubbled with pure N2 for 10 min to reduce dissolved oxygen concentration to 0.9 mg L-1, and (iii) dN2–the bubbled solution with N2 for 10 min was poured into open containers allowing to restore dissolved oxygen concentration to 5.3 mg L-1 over a 48-h period. The details of species and isolates as well as the zoospore survival assay protocol are described below. For simplicity, only data from P. tropicalis are presented. Dissolved oxygen elevation and reduction was achieved by bubbling pure oxygen (O2) or nitrogen (N2) into 10% Hoagland’s solution in the bottles. For dissolved oxygen concentration elevation, oxygen was bubbled at 0.5 L min-1 for 0, 15, 30, 45, 60, 75, 90, 120 or 150 seconds. Dissolved oxygen concentrations were measured immediately after bubbling. This experiment was repeated three times. The dissolved oxygen concentration in the solution after bubbling 90 seconds were out of range of the DO 200 meter which can measure up to 18 mg L-1. Data from repeating experiments were pooled after homogeneity test. Prior to the further analysis, bubbling time was divided into 15-second segments and assigned numerical values with 1 for the first (0-15 seconds), 2 for the second (16-30 seconds), and 5 for the fifth (61-75 seconds). Correspondingly, dissolved oxygen elevation was computed for individual 15-second time segments with 3.2, 2.4, 2.2, 1.8, and 1.5 mg L-1 for the first, second, third, fourth and fifth (Table 1). The speed of dissolved oxygen concentration elevation was then related to these 15-second time segments using Proc GLM (SAS Institute, Cary, North Carolina, USA). A resultant model was used to make elevated concentrations of dissolved oxygen as desired in the zoospore survival assays. To track the dynamics of dissolved oxygen concentration in the solutions, additional measurements were taken at 2, 4, 8 and 24 h following oxygen bubbling. All bottles were sealed with parafilm then capped tightly after bubbling and each measurement. yThese numbers are meter readings and the meter cannot measure dissolved oxygen above 18.0 mg L-1. ZThese values are calculated based on a regression model: y = 3.2 - ln (x), as generated from the SAS analysis. For dissolved oxygen reduction, pure nitrogen gas was bubbled into the Hoagland’s solution in the bottles at 0.4 L min-1 for 2, 5, 10, 20, or 30 min. Dissolved oxygen concentrations were measured immediately after bubbling subsequently selected for the zoospore survival studies. Similarly, the dynamics of dissolved oxygen concentration in the solutions was tracked following the N2 bubbling. Irrigation water isolates of four Phytophthora species: P. megasperma (isolate 42D2), P. nicotianae (45H1), P. pini (previously, P. citricola, 43H1) and P. tropicalis (7G9) were used in this study . These species had differential responses to pH stress . Cultures were maintained and zoospore suspensions were prepared as described previously . Briefly, zoospore suspension was prepared with agar plugs from one-week-old cultures. The plugs were grown in 10% clarified V8 juice broth at room temperature for 7 days for P. nicotianae and P. tropicalis, and 3 days for P. megasperma and P. pini. After the media were removed, the cultures were then rinsed with sterile distilled water (SDW), drained and exposed to fluorescent light for 24 - 48 h for P. nicotianae and P. tropicalis, 8 h for P. megasperma. For P. pini, the cultures were flooded with SDW again then incubated under lights for 8 h to facilitate sporangium production. After the light exposure, water was drained then plates were refilled with chilled sterile soil water extract to trigger zoospore release. Zoospore yields reached > 104 mL-1 after 30 min for P. nicotianae and P. tropicalis, and after overnight for P. megasperma and P. pini. Zoospore suspensions were filtered through a layer of sterile miracloth to remove cultural plugs and mycelia. Zoospore concentrations were determined with a haemocytometer. Three sets of zoospore survival assays were performed to determine the impacts of (i) potential side effect of nitrogen as a replacement gas for oxygen in the Hoagland’s solutions, (ii) elevated and (iii) low concentrations of dissolved oxygen in comparison with the regular concentration in the control solutions that were not bubbled with any gas (O2 or N2). The elevated concentrations of dissolved oxygen tested were 11.3, 15.2, 18.1, 19.2, 20.1 mg L-1, and the normal concentration of 5.6 mg L-1 (control) along with reduced concentrations of dissolved oxygen at 2.0, 1.2, and 0.9 mg L-1. The dissolved oxygen treatments were made as described above. A certain volume of fresh zoospore suspension was added to each bottle to make a final concentration of 50 zoospores mL-1 without altering the dissolved oxygen concentration in the Hoagland’s solutions. Bottles were gently inverted twice then two or three 1-mL aliquots were taken out from each bottle within 10 min. Each aliquot was spread onto a 90-mm plate with PARP-V8 agar . Additional samples were taken at 2, 4, 8, and 24 h in the elevated dissolved oxygen assays. Two more samples were taken for the reduced dissolved oxygen assays at 48 or 72 h, respectively. The plates were placed at room temperature for 2 to 3 days. Emerging colonies in each plate were counted and the colony counts were used to measure zoospore survival in the Hoagland’s solutions at various concentrations of dissolved oxygen for different exposure times. Each experiment included three replicate bottles and was repeated at least three times. Data of zoospore survival rates as measured by resultant colony counts from repeating assays were examined for homogeneity then analyzed separately with Proc ANOVA. Mean survival rates of three replicates from 6 or 9 plates were separated by the least significant difference (LSD) at P = 0.05. Linear regression analyses were performed to determine whether and how the elevated concentrations of dissolved oxygen may affect the colony counts by Phytophthora species and exposure time. Similar analyses also were conducted to determine whether and how the level of dissolved oxygen reduction in the Hoagland’s solutions from its normal concentration (5.3 mg L-1) may influence the colony counts of four Phytophthora species at different exposure times. In preliminary studies using hydrazine hydrate and CO2 to manipulate dissolved oxygen concentration in Hoagland’s solution, we found that both chemicals themselves significantly reduced zoospore survival [10, 22]. Nitrogen was used as replacement gas for oxygen in previous investigations into the mycelial growth of Aphanomyces euteiches, Phytophthora cactorum, Pythium ultimum, and spore germination of Phytophthora citrophthora, Phytophthora nicotianae, and Thielaviopsis basicola in liquid medium [17, 26]. Nitrogen also was used in hydroponic systems to investigate root infection of avocado (Persea americana), shortleaf pine (Pinus echinata) and loblolly pine (Pinus taeda) by Phytophthora cinnamomi[21, 27, 28]. However, none of these studies evaluated the potential impact of high concentration of nitrogen itself. Thus, the first assay performed was to determine whether nitrogen itself impacts zoospore survival. Hoagland’s solution at 10% strength was used as base medium and four species of Phytophthora were included in this assay. 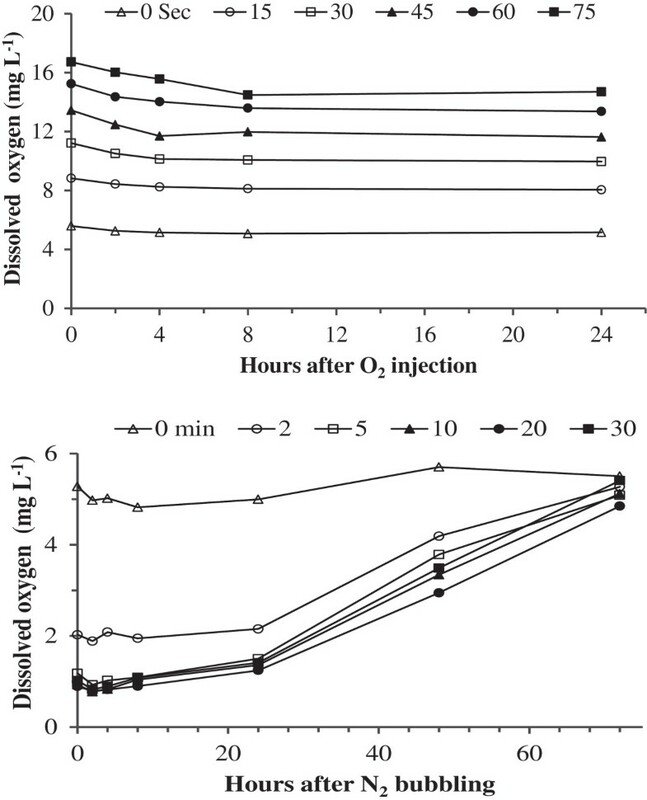 Zoospore survival was compared among three solutions: (i) control solutions (CK) as a static 10% Hoagland’s solution with dissolved oxygen at 5.6 mg L-1, (ii) bubbled with nitrogen (N2) to reduce dissolved oxygen concentration to 0.9 mg L-1, and (iii) degassed after nitrogen bubbling (dN2) with a final concentration of dissolved oxygen similar to that in the control solution. 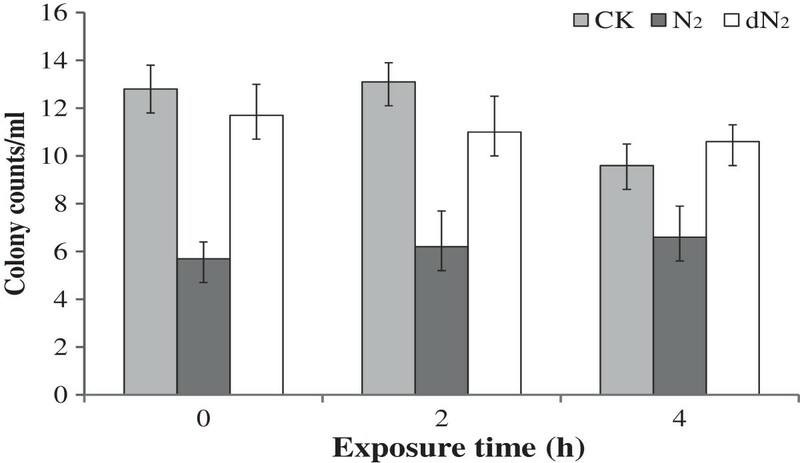 No difference in colony counts was observed between the control and degassed solutions (dN2) regardless of exposure time as illustrated by P. tropicalis (Figure 1). As expected, more colony counts were consistently resulted from the degassed solutions (dN2) than those not degassed (N2) solutions (Figure 1). These results indicate that dissolved nitrogen in the Hoagland’s solution had no effect on the zoospore survival. Similar results were obtained for the other three species evaluated in this study. These results implicate nitrogen had no impact on spore germination, mycelial growth, and root infection of avocado and pines in those previous studies [15, 17, 21, 24, 25, 27, 28] and it is a good replacement gas for the subsequent assays in this study. Impact of dissolved N 2 and oxygen on zoospore survival of Phytophthora tropicalis . CK, 10% Hoagland’s solution (pH 7) at dissolved oxygen (DO) of 5.3 mg L-1 without N2 bubbling; N2, same solution bubbled with N2 for 10 min to reduced DO to 0.9 mg L-1; dN2, same solution bubbled with N2 for 10 min then aerated until DO returned to 5.3 mg L-1; Each column is a mean of the three replicates, topped with standard deviations of the mean. in which y is the speed of dissolved oxygen elevation (mg L-1) per 15 seconds; x is the number of 15-second segments (x > 0). The concentrations of dissolved oxygen in the solutions after being bubbled with oxygen for 90, 120 and 150 seconds were estimated to be 18.1, 19.2, and 20.1 mg L-1, respectively (Table 1). Dissolved oxygen concentrations decreased with increasing nitrogen bubbling time up to 10 minutes (Table 1). Extended nitrogen bubbling for 20 and 30 min did not further decrease the dissolved oxygen concentration in the Hoagland’s solutions (Table 1). Thus, these 20 and 30 min treatments were excluded from the subsequent studies. There was little change in the dissolved oxygen concentration within the 24 h of oxygen and nitrogen bubbling (Figure 2). However, dissolved oxygen concentration in the Hoagland’s solutions was gradually restored to its original concentration of 5.3 to 5.6 mg L-1 within 72 hours of bubbling regardless of gas treatment (O2 or N2). Dynamics of dissolved oxygen levels in 10% Hoagland’s solution following O 2 (top) and N 2 (bottom) bubbling. Among the four species assessed in this study, only zoospores of P. megasperma in the control bottles at dissolved oxygen concentration of 5.6 mg L-1 consistently declined with increasing exposure time as reflected in the intercept of the linear models (Table 2). The greatest colony count of this species was observed at 10-min and 2-h exposures and the least at 24-h exposure. It is not known at this time why the greatest colony counts of P. nicotianae, P. pini and P. tropicalis occurred at 2- or 4-h instead of 10-min exposures. zLinear model: y = a + bx, in which x ≥ 5.6 mg L-1. As indicated by the slope of linear models, zoospore survival of all four species were negatively impacted by elevated concentrations of dissolved oxygen for most exposure times (Table 2). For instance, the colony counts of P. megasperma decreased with increasing dissolved oxygen concentration at 10-min (P < 0.0001), 2-h (P = 0.0010) and 4-h exposures (P = 0.0324). The colony counts of the other three species decreased with increasing dissolved oxygen concentration at all exposure times with a few exceptions. As indicated by the slope of linear models, the greatest rate of decrease in colony counts occurred at 4-h exposure with 0.7 colony per unit of dissolved oxygen increase for P. nicotianae (P = 0.0001), 1.4 for P. pini (P < 0.0001), and 0.6 for P. tropicalis (P = 0.0004), respectively. The only exceptions were observed in P. megasperma at 24 h, P. nicotianae at 10 min and 24 h, as well as P. pini at 10 min. These results indicated that zoospore survival in runoff water containment basins is subjected to fluctuations of dissolved oxygen concentration in particular of hyperoxia conditions although there are slightly differences among the four species assessed in this study. P. megasperma was least affected by elevated concentrations of dissolved oxygen as was by a range of pH in a previous study . Differences in oxygen response were previously observed among oomycetes and fungi. By their oxygen response, these fungi and oomycetes can be grouped into three categories. First, mycelial growth is directly proportional to atmospheric oxygen level with the optimum at 21.0%. This pattern is exemplified by P. nicotianae (syn. P. parasitica), P. citrophthora and T. basicola and P. cactorum. Second, mycelial growth has a clear optimal oxygen level typically well below 21.0%, which distinguishes this group from those of the first pattern. Examples of this group included A. euteiches that had optimal growth at 5.0% . Third, mycelial growth increases with increasing atmospheric oxygen only to a concentration, above which results in no further growth benefits. This pattern is illustrated by P. ultimum, of which mycelial growth was reduced at oxygen concentration of 1.3% but was the same for all oxygen levels from 4.0% to 21.0% . It is unclear how the elevated concentrations of dissolved oxygen affected zoospore survival of different species. In this study we did observe that zoospores of P. nicotianae, P. pini and P. tropicalis remained motile for more than 2 h after their release from sporangia while the most zoospores of P. megasperma had already encysted before they were added to the 500-ml volume at the various dissolved oxygen concentrations. It is reasonable to assume that motile zoospores are more vulnerable to environmental stresses including elevated concentrations of dissolved oxygen or hyperoxia than those encycled ones with cell wall. It is worth of noting that zoospores of P. nicotianae died instantly in a 9.5-L fish tank being bubbled with oxygen at 0.5 L min-1 for 20 min under a separate experiment . The dissolved oxygen concentration in this fish tank was estimated to be over 27.3 mg L-1 according to the formula developed above. It also was previously reported that hyperoxia suppressed fungi and bacteria [29, 30]. Artificial oxygenation of irrigation water for pathogen mitigation may not be economically feasible. However, dissolved oxygen concentration in irrigation reservoirs can naturally rise up to 26.5 mg L-1 due to phytosynthetic activities . Zoospores are the principal, if not sole, dispersal and infective propagules of Phytophthora and Pythium species in recycling irrigation systems [31–35]. Thus, the results of present study, along with those of previous studies [15, 17, 21, 24, 25, 27, 28], help understand the dynamics of these pathogens in irrigation reservoirs under hyperoxia conditions [36, 37]. As in the dissolved oxygen elevation assays, the greatest colony counts in the control bottles occurred at 10-min exposure for P. megasperma and at 2- or 4-h exposure for the other three species (Table 3). zLinear model: y = a + bx, in which x = 5.3 - meter readings of dissolved oxygen in the Hoagland’s solutions after being bubbled with pure nitrogen, so 0 ≤ x ≤ 5.3 mg L-1. Zoospore survival of the four species assessed in this study also was negatively impacted by low concentrations of dissolved oxygen in two distinct patterns (Table 3). One pattern is represented by P. megasperma and P. pini. The impact on these two species generally occurred at 4-h or longer exposures at which their colony counts decreased with increasing level of dissolved oxygen reduction from the normal concentration of 5.3 mg L-1 in the control Hoagland’s solution. The greatest rate of decrease in colony counts occurred at 48-h exposure for P. megasperma at 0.9 colony per unit of dissolved oxygen reduction (P = 0.0015) and at 4-h exposure for P. pini at 2.1 (P = 0.0002). Phytophthora nicotianae and P. tropicalis showed an exactly opposite pattern. The colony counts decreased with increasing level of reduction in dissolved oxygen concentration at both 2- and 4-h exposures for P. nicotianae, 10-min and 2-h exposures for P. tropicalis. These results indicate that P. nicotianae and P. tropicalis are more prone than P. megasperma and P. pini to hypoxia stress in aquatic environments. They help understand the more consistent and greater recoveries of P. megasperma and P. pini than other major plant pathogens including P. nicotianae and P. tropicalis in irrigation systems [5, 36, 37]. Nevertheless, zoospore survival of all four species decreased with increasing intensity of hypoxia. Dissolved oxygen concentration in surface water of irrigation reservoirs can be as low as 0.3 mg L-1. This degree of hypoxia is likely to have more pronounced impact on the survival of zoospores in irrigation systems than what observed in this study. The results of present study are critical to understanding the population dynamics of Phytophthora species in irrigation reservoirs during hypoxia conditions [36, 37]. In this study we showed for the first time the zoosporic responses to oxygen stress of four economically important species of Phytophthora in a simulated aquatic system. Zoospores of these species survived the best in the control solutions at dissolved oxygen concentrations of 5.3 to 5.6 mg L-1. Zoospore survival rate decreased with increasing intensity of hyperoxia and hypoxia conditions, depending upon Phytophthora species and exposure time. This study also demonstrated that P. megasperma had decreasing colony counts with increasing exposure hours from zero to 24 h while the other three species (P. nicotianae, P. pini and P. tropicalis) had the greatest colony counts at 2 and 4 h during the first 24 h of both elevated and low dissolved oxygen assays. Once again, this study demonstrated that zoospore mortality increases with increasing number of exposure days as did in previous studies [6, 7, 9]. This natural zoospore decline process was enhanced under hyperoxia and hypoxia conditions. These findings suggest that seasonal and diurnal fluctuations of water quality including dissolved oxygen [13, 38] more than likely had contributed to the population decline of Phytophthora species along the water path in the same agricultural reservoirs [36, 37]. These findings advanced our understanding of aquatic ecology of Phytophthora species. They also provided an important basis for pathogen risk avoidance and mitigation by designing better recycling irrigation systems and modifying existing systems to prolong runoff water turnover time. This study was supported in part by a grant from the USDA National Institute of Food and Agriculture-Specialty Crop Research Initiative (Agreement #: 2010-51181-21140). PK designed and performed the experiments. PK and CH analyzed the data and wrote the manuscript together. Both authors read and approved the final manuscript.